string(1133) "Resource Centre > Uncategorized > Health and wellbeing of Nepalese migrant workers abroad 2018"
Purpose- Although South Asia is a growing supplier of migrant labour, there is a paucity of research on the health and wellbeing of male Nepalese migrant workers. 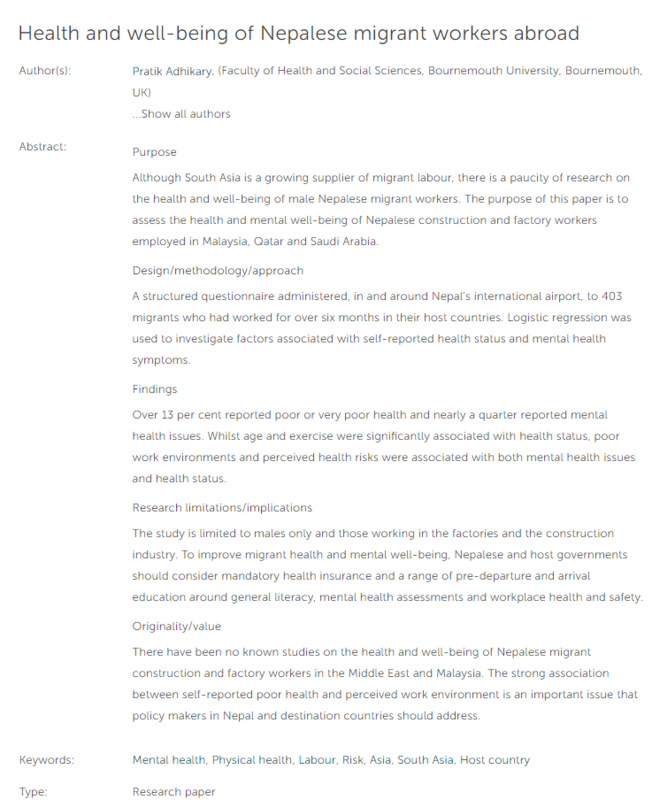 This study assessed the health and mental wellbeing of Nepalese construction and factory workers employed in Malaysia, Qatar, and Saudi Arabia. Design- A structured questionnaire administered, in and around Nepal’s international airport,to 403 migrants who had worked for over six months in their host countries. Logistic regression was used to investigate factors associated with self-reported health status and mental health symptoms. Findings- Over 13% reported poor or very poor health and nearly a quarter reported mental health issues. Whilst age and exercise were (only) significantly associated with health status, poor work environments and perceived health risks at work were associated with both mental health issues and health status. Research limitations/implications- The study is limited to males only and those working in the factories and the construction industry. To improve migrant health and mental wellbeing, the Government of Nepal and host governments should consider mandatory health insurance and a range of pre-departure and arrival education around general literacy, mental health assessments and workplace health and safety. Originality/value- There have been no known studies on the health and wellbeing of Nepalese migrant construction and factory workers in the Middle East and Malaysia. The strong association between self-reported poor health and perceived work environment is an important issue that policy makers in Nepal and destination countries should address.